Encourage The Young Women | Come, let us reason the Scriptures together. Encourage The Young Women: Come let us reason the Scripture together is now available at Amazon.com for Kindle. Click here for details. For all eBook formats and paperback, click here for all options. I am pleased to announce that Encourage The Young Women: Come let us reason the Scripture together, is now available in eBook as well as paperback. Currently available at Smashwords for $2.99, I hope to see it listed at other online booksellers soon. It is available in the following formats: epub, mobi, pdf, rtf, lrf, pdb, and txt. Smashwords offers a free sample of the book, so do check that out. The eBook is nearly identical to the print version, with a few necessary adjustments made for the eBook format. There are slight differences in font and formatting, but the biggest difference is with the word studies. In the paperback, word studies contain the actual Hebrew and Greek words in their respective fonts. The eBook edition contains the English transliteration of these words only. The print edition is available from numerous online booksellers. Click here for a list with links. For a 25% discount on the paperback for blog readers and followers, click here. 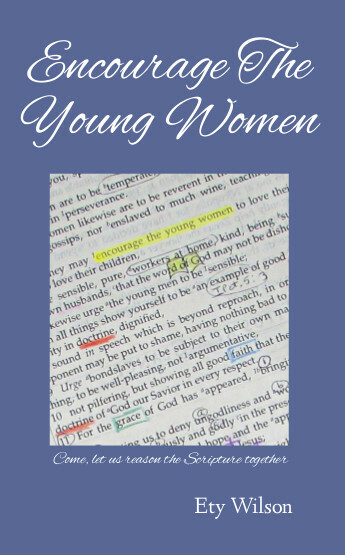 Encourage The Young Women is now available in paperback, covering the same Scripture-based content as the blog. “Come, let us reason the Scripture together.” Can the Bible possibly offer reasonable solutions to the many issues facing modern Christian women today? ~ How do I balance family and career? ~ What is the best Christian ministry for women? ~ Does the Bible really teach sexual inequality? ~ Is submission a curse? Is God saying I’m inferior? ~ Is mutual submission the answer? ~ Respect my husband? What if he doesn’t deserve it? ~ What if my husband isn’t qualified to be spiritual head? ~ How do I love my husband when I don’t feel like it? ~ What is a woman’s power? Over whom is it used? Encourage The Young Women examines how the Word of God answers these questions. It explores what the Bible has to say by showing the reader how to observe, interpret, and apply Scripture for herself. The 2 to 4 page chapters are perfect for devotional or Bible study. 296 pages, list price is $12.95. It is currently available on Amazon , but blog readers and followers can get 25% off the list price at my CreateSpace eStore. Click here and enter code SLQ8CXHR at checkout. UPDATE: 8/15/2014. An eBook edition is now available. Click here for details and where to order. The Holy Bible: Word of God? Or Word of Man? Dignity: A Basic Human Right? Love: More Than a Feeling? How Many Kinds of Gossip Are There, Anyway? Submission: Where Do We Draw the Line? Genesis 3 : So What Happened? The Excellent Woman: By Whose Definition? This summer Encourage The Young Women will be published and available as a book. I hope it will be useful as an encouragement, personal devotional, or for small group Bible study. Watch here for details. Encourage the Young Women is currently on sabbatical.